I've totally revamped the Awards screen in the Tournament App. Calculating awards was a bit screwbally anyway. I figured it was a good time to redo the whole thing. Joe wanted a more editable awards screen. Not every tournament is going to use every award that the app does. 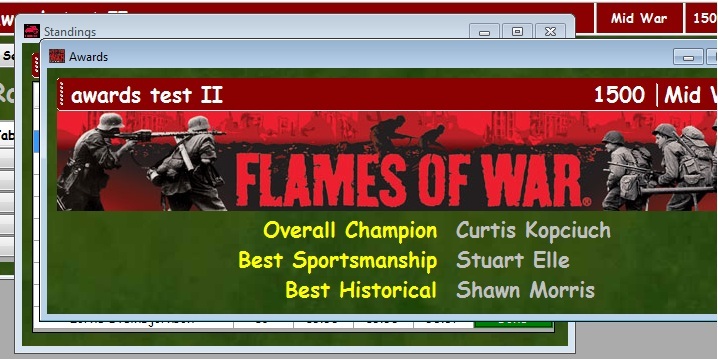 So, I've added an edit awards screen. For now it has 13 base awards to choose from. You are allowed to edit the name and its Priority. Then you can check only the ones you want in your tournament. 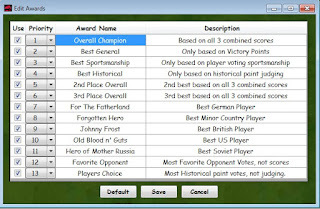 In a tournament only one player can win each award, with the exception of player's choice and favourite opponent. What setting the priority does is change when an award is calculated. 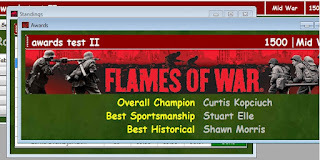 For me I'd prefer to see historical ahead of sportsmanship because most people get the close to the same score anyway. There is no way I want the best sportsman award if I have the best paint. Hey, but that's just me. So I would set historical to a higher (lower number) priority then Sportsman. 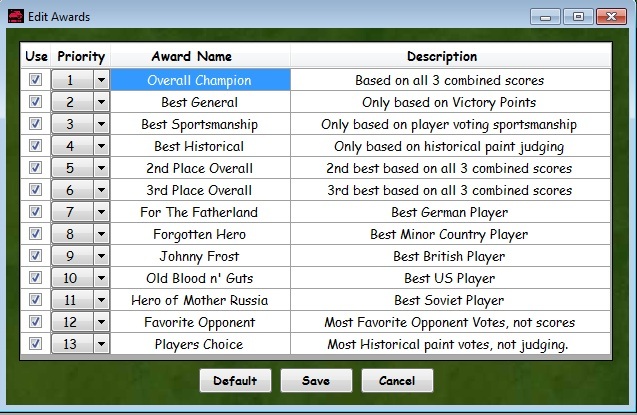 Once your tournament is over and you click on the awards button, only the awards you've checked will show up and in the order of Priority. This was one of the more complicated formula's I've done for this app, trying to figure out all these types of awards and how to get them to populate in the proper order. I think this app is pretty much ready for use. Although I've had one offer to test, so I'm sure there will be bugs as people actually start to use it. Just want to make a couple of more changes then I'll create a new build.